Use a microbrush to apply a thin coat of cement inside of the implant crown. Avoid excess cement that can lead to difficulty retrieving the restoration, if necessary. Apply a thin layer of Cem-Implant to cervical 1/3 of the crown; for increased retention, apply to cervical 1/2. Remove as much excess cement as possible before it hardens. Cem-Implant (B.J.M. 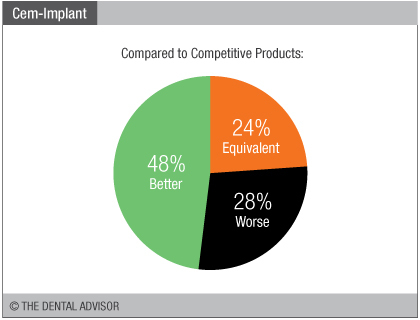 Laboratories) is a non‐eugenol, resin cement indicated for long‐term cementation of permanent, implant‐retained crowns and bridges as well as long‐term provisional restorations. Cem-Implant (B.J.M. 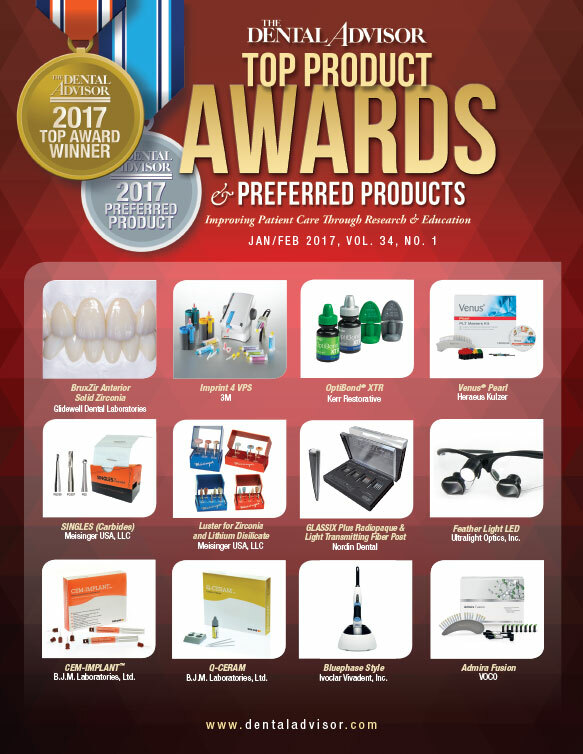 Laboratories) offers secure retention, retrievability, radiopacity, and low solubility. Working Time is 45-60 seconds. The two‐stage cure features an initial gel‐phase in about two minutes for removal of excess cement and a rigid final set in four to five minutes. 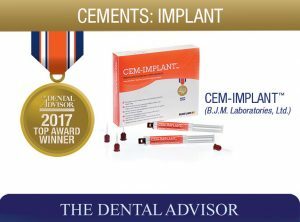 Cem-Implant comes in an esthetic, natural gingival shade. The kit contains two, 5 mL automix syringes of cement with 20 mixing tips. Cem-Implant (B.J.M. Laboratories) was evaluated by 29 consultants in 344 uses. 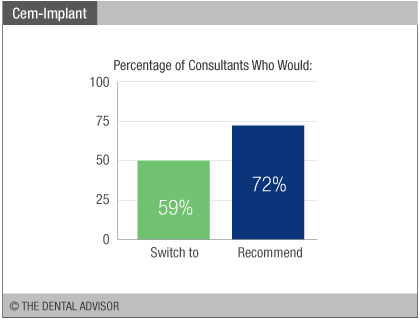 This implant cement received an 86% clinical rating. Cem-Implant (B.J.M. Laboratories) is easy to apply in a small amount through the short, tapered mixing tips. The light pink, gingival shade has a neutral appearance in thin layers. The smooth consistency can be spread inside the crown, and it stays where placed and flows under pressure. If excess cement is removed before the final set, it peels away cleanly. After the five minute setting time, the cement is very rigid, and cleanup is more difficult. Cem-Implant (B.J.M. Laboratories) is radiopaque for identification of subgingival cement. 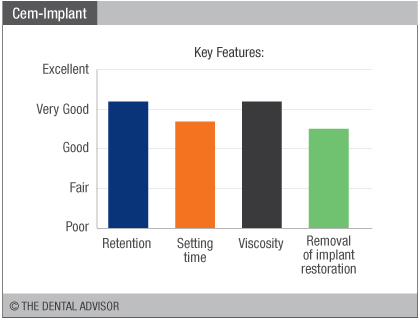 For cases in which future removal of the crown is anticipated, Cem-Implant provides retrievability.